The United Kingdom’s financial expectations stabilise in March, but households report sharpest fall in their appetite for major purchases since September 2017. At 43.3, down from 43.4 in February, the seasonally adjusted IHS Markit Household Finance Index (HFI) – which measures households’ overall perceptions of financial wellbeing – was the lowest for 13 months. The headline index has been on a downward trend after reaching a two-and-a-half year high last August. March data signalled a tighter squeeze on UK household finances, reflecting a sharper rise in living costs and the steepest drop in cash available to spend since April 2018. 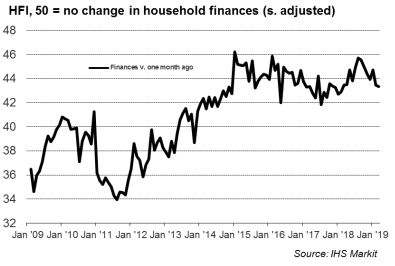 Meanwhile, resilient labour market conditions appear to have supported households’ expectations for their finances over the next 12 months. Latest data indicated the lowest degree of pessimism about the outlook for financial wellbeing since November 2018. On a more positive note, there were signs of reslience in terms of labour market sentiment during March. Latest data indicated that concerns about job security were the least widespread for three months. Survey respondents also signalled a slight increase in their anticipated living costs over the next 12 months, with the index measuring households’ inflation expectations at its highest so far in 2019. In addition, there were signs of greater divergence in terms of UK households’ expectations for the next move in the Bank of England base rate. The majority view among UK households (67 percent) remains that the central bank will raise interest rates at some point in the next 12 months. "A sharp drop in UK households’ appetite for major purchases was the main signal that Brexit uncertainty had some impact on consumer spending. This index was close to a five-year low, which may reflect a wait-and-see approach to holiday bookings and other big-ticket spending commitments during the latest survey period," said Tim Moore, Associate Director at IHS Markit.